Safety Training Eating Up Your Budget? Takeaway: Why eLearning is a cost effective option for safety training. Poorly trained employees are not only a major safety hazard, they can be disastrous for productivity as well. When an employee doesn’t know how to handle equipment properly or do his/her job safely, it can lead to major incidents and time loss. Therefore, it’s essential that employers, especially in high risk industries, ensure that all of their employees are properly trained and that their employees renew their training as required. The traditional methods of in-class training and using paper and Excel to maintain and track employee training records are costly and time consuming. Thankfully, technology has stepped up to the plate, and cost effective and convenient alternatives are now available for not only delivering, but also tracking employee training. eLearning courses are typically 50% cheaper than in-class courses. 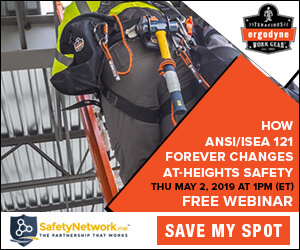 For instance, a Fall Protection in-class training course can range from $60 to $145 whereas an eLearning Fall Protection course can cost as little as $35 which gives you a minimum of nearly 50% savings on the cost of Fall Protection training per employee. eLearning provides your employees with the training they need at a much lower rate than in class training course. In-class training happens at specific locations and usually not in proximity of most remote job sites. Therefore, most employers have to absorb the costs of their employees traveling to these in-class training sessions as well. Sometimes hotel stays are also required for employees to take these courses. Not only are you paying more per course, but you also have to account for the costs of your employee traveling to the in-class training and potentially staying nearby if the training is not within driving distance. When you use online training, your employees can take training courses wherever is convenient as they only require a computer or laptop to do so. Not only do you save on the cost of the course but you save on travel expenses as well! When employees do in-class training, daily business can be disrupted because employees require time off. Furthermore, in-class training has a limited number of seats per class so your employees must fit into the in-class training schedule rather than having training times accommodated to work schedules. When you use online training, employees can take courses at any time, whenever is convenient. You can schedule online training around your work schedules to allow for minimum disruption to your daily business. Despite all of the benefits that come with eLearning, there are certain drawbacks which are important to consider when deciding between eLearning and in-class courses. Course Limitations: Not all safety training courses are available for eLearning. Some courses still require in-class training and cannot be taken online. Before considering eLearning options, you should check to see if online training is actually available for the courses your employees require. Learning Approach: People learn in many different ways. While most eLearning courses try to incorporate various learning styles to appeal to a broader audience, it’s difficult to accommodate every learning style. Some people will find it very difficult to learn from an eLearning course. It’s important for your workers to receive and retain the necessary safety training so you must consider what the most effective method of learning will be for your employees. No Teacher Present: Another drawback to eLearning is that there is no physical teacher present while your workers are taking the safety training course. If a worker has questions and requires clarification on some of the material covered in the eLearning course, there’s no one there to provide immediate help or answer questions. If your workers are struggling with the material presented, the lack of an actual teacher could pose a problem. Although eLearning is a cheaper and more convenient option for training, you need to do your research and consider how your employees learn before choosing between traditional in-class training courses and online safety training. After you get your employees trained, their training certificate need to be stored for proof of training and in most situations a retraining date needs to be recorded. Paper certificates can get lost and if your filing system isn’t completely up to date, they may take longer to track down when an OSHA auditor comes to inspect your job site. Using Excel and paper to track employee training can be equally tedious given the time required to manually update spreadsheets and constantly check and re-check against your own logs. The inefficiencies of using spreadsheets to track employee training takes away valuable time that could be spent executing and analyzing safety activities. Software can significantly reduce the administrative burden by instantly updating retraining dates, running training reports and automatically sending training reminders to staff. Conducting training and then tracking completion used to be a tedious, time consuming and expensive job. Thanks to advances in technology, many safety courses can now be taken online for a lower cost and at the convenience of your worker. Cloud safety software can perform the administrative tasks associated with tracking employee training so whoever manages your training records can spend time on more value-added tasks. The only thing better than using online training and cloud safety software is using a program that combines the two. Certain safety software companies now provide an eLearning subscription where your employees have access to an entire library of training courses for an annual user fee, further increasing your savings on safety training. eLearning subscriptions that fully integrate with safety software will automatically load the training certificate right to the employee’s profile once training has been completed as well, which means no one will have to be concerned about one being misplaced or lost. At the end of the day, your employees need safety training and technology provides a more affordable and convenient way to do this job. For a safety software that takes away the administrative burden of training tracking and has an eLearning subscription feature, click here to visit. What metric should I track to make sure my safety training programs are effective? What will my company have to do to adapt to the new electronic submission requirements from OSHA's Final Rule? How can predictive analytics improve workplace health and safety? What can companies do to reduce their lost time injury frequency rates? How are predictive analytics tools changing safety reporting best practices? How can I better engage my employees? What questions should I ask when surveying my employees on engagement? What are the elements of a successful behavior-based safety program? What is the purpose of COR? What are some of the advantages of having a certificate of recognition? How would you recommend companies simplify the COR process? How much work is involved in receiving a COR and how long can we expect it to take from registration to certification? What can be expected in the future in regards to businesses being required to have COR?